Brush morning and night, floss twice daily, and take care of your teeth. We all have heard these statements from a young age however, what some may not realize is the food we eat on a daily basis has a major effect on the health of our teeth. Whether you are enjoying that casual drink after work or eating that piece of toast for breakfast every morning, many of us do not think these practices are harmful for our teeth. We all know that brushing and flossing help prevent cavities but many of us never quite learn how cavities or tooth decay form. 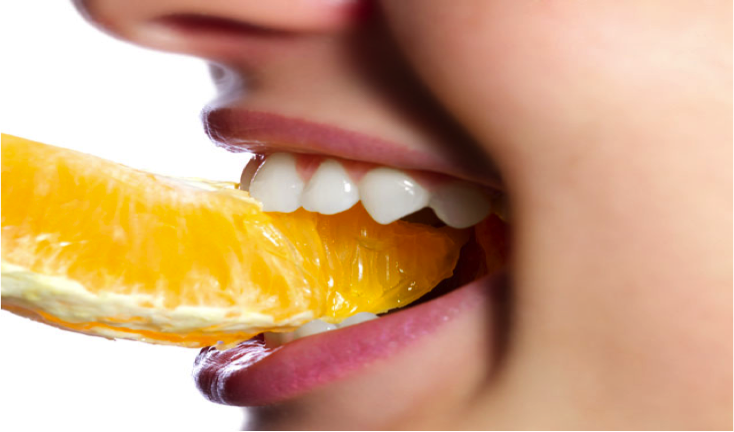 Cavities and tooth decay are a result of a deficiency of vitamins, minerals, and other nutrients found in food that the body needs to build healthy teeth. Monitoring what you eat and drink everyday can drastically impact your oral health however, consuming the proper nutrients for our teeth can be challenging. Today’s hectic lifestyles force many of us to choose processed food and sugary drinks that do damage to our teeth’s enamel. Unfortunately, these foods can negatively impact oral health as they tend to be over sweetened, over heated, and over processed. Maintaining a healthy set of teeth is like maintaining a car. To keep a strong running vehicle, you must fill it with the correct gas and perform repairs when needed. Similarly, teeth require the proper nutrients and care to stay healthy and strong. The next time you go to get coffee before work, grab a tooth-friendly green tea instead. Rather than snacking on some potato chips at your desk, munch on crispy vegetables. Small choices like these can lead to big results in the long run. The family dentists at Dakota Dental are here to provide tips on how to eat for your teeth. Set up an appointment at our Apple Valley dentist office or contact us today to learn more about maintaining great oral health.